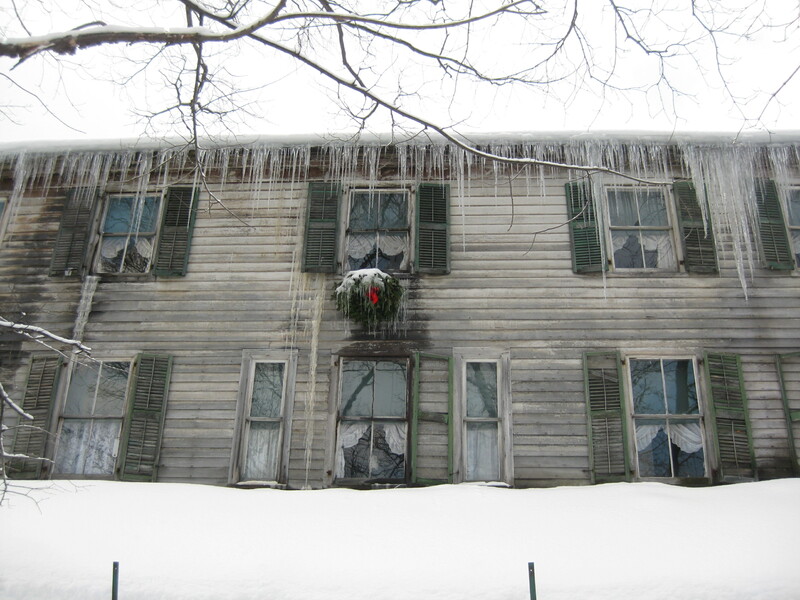 Located in the Old Bennington Historic District, the Walloomsac Inn is the oldest inn in the State of Vermont. The building was constructed in 1764, with additions and alterations to the roof throughout the late 1700s and 1800s. Five prominent families owned and operated the inn throughout its life; the inn served the stagecoach road until the 1850s. Important figures such as Thomas Jefferson, James Madison, Rutherford B. Hayes and Benjamin Harrison have stayed at the inn. 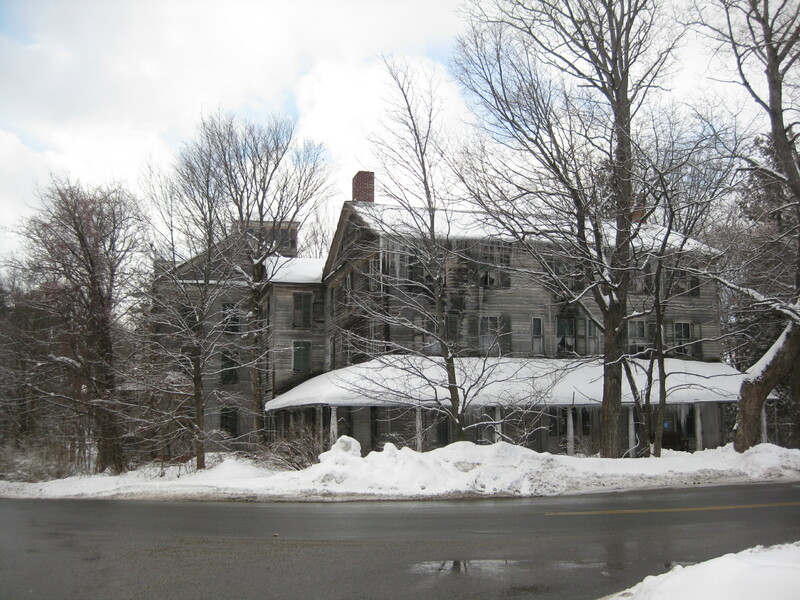 Although its name has been changed a few times, it was most recently known as the Walloomsac Inn. Until about 15 years ago, the building operated as a bed-and-breakfast, but today it is a private residence. An unwelcoming sign on the front door informs the public that it is private property and to stay off the porch and property. The Walloomsac Inn, on the corner of Monument Avenue and Route 9 in Bennington, Vermont. View of the Route 9 side. Note the poor condition of the front elevation and Christmas wreath. The sun came out for a bit, highlighting the colors of the building. At least the first floor is occupied by the owners. 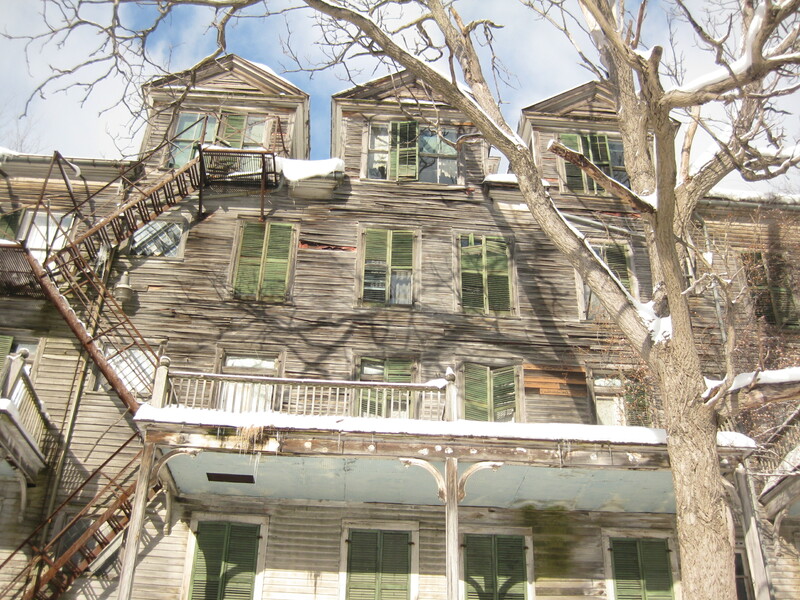 Can you imagine such a beautiful house suffering a fate of deterioration and neglect? 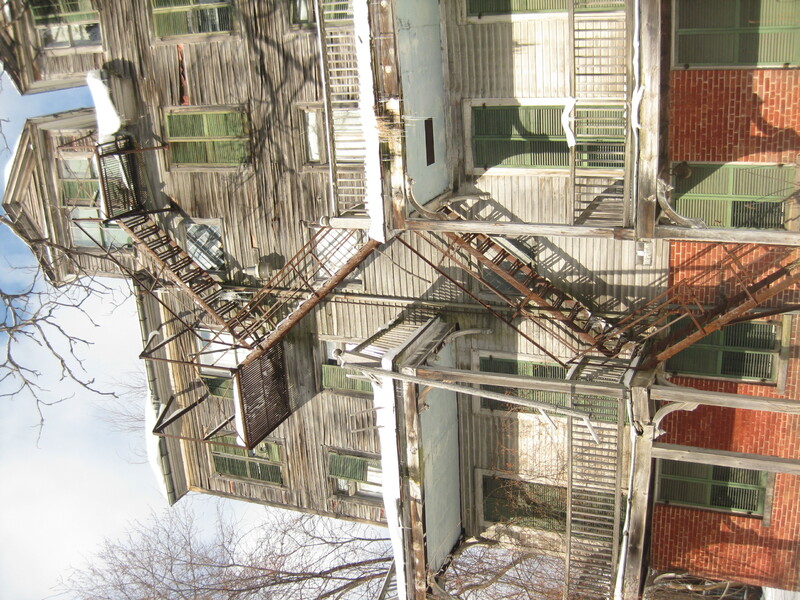 It’s incredibly sad; such an important landmark in the Old Bennington Historic District and in the State of Vermont should be saved and loved! The loss of this building would be catastrophic. It breaks my heart, and I’ve only passed by the building a few times. However, I do not know the entire story. 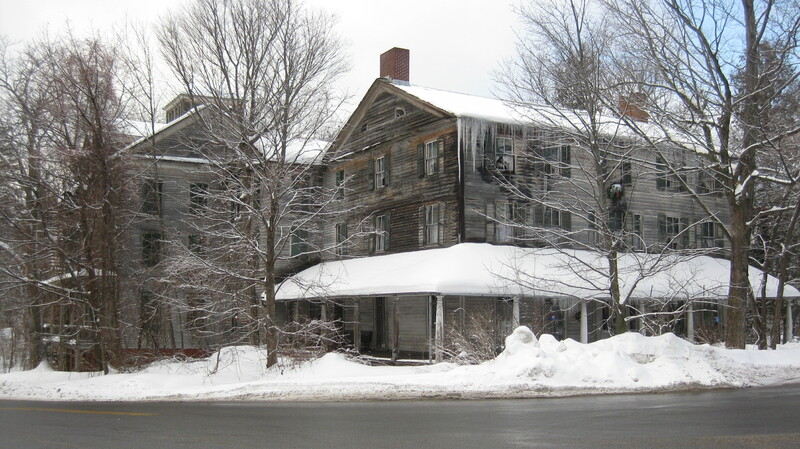 An article (Ethan Allen, page 14) talks about the cost of code upkeep and zoning laws that would prevent the building from operating as an inn once again. Readers, are any of you Bennington residents? What is the latest news on this building? Perhaps the owners truly love the building and just do not know what to do. If that is the case, the town should certainly take an interest and develop a solution. Thoughts? For additional historical information, read the Bennington Museum’s writeup. Save the Wilderness! Stop Walmart! Wow…what an incredible historic inn!! Is the building listed on the NRHP or does it have any type of local landmark designation status? Just wondering if the owners had looked into the potential for tax credits. The legal zoning issues remind me of a similar controversial situation with a historic inn in Hillsborough (NC). Looks like there is great potential! Hi Megan, the building is listed on the NR as part of the Old Bennington Historic District. I do not know any other details in terms of zoning. Tax credits would be wonderful, but, as we know, it’s likely more complicated from that. I’m hoping someone from Bennington will read this and fill me in on the details. Good Afternoon Kaitlin. I have written you before on the Inn and the wife and I just returned home from Bennington and I have made a very substantial breakthrough on this beautiful old Inn. We met some people in Bennington that know all about the history of just about anything. We talked for quite a while and I found one of my big suspicions was correct. You look at all the pictures of the Inn and you will not see any sag at all. I have often wondered if it might be made of brick. Well guess what! It is. Brick construction and faced with the clapboard siding. ALL of the damage that you see is totally cosmetic! The Inn will not fall down any time soon. Now for a bigger mystery. Why does it look the way it does? The Ladies that own it were given it when their father died. Are you ready for this? The Will stated that nothing was to be done with the property. Not sure but I believe they took it just a little to literally. Also we have found a home made book detailing the history and the owners of this book are making us a copy. There are all sorts of historical dates, Photos and I believe I even saw a menu from the Inns dining room. This was a Great day to get out of bed! Wow! What interesting information – especially the brick and the literal interpretation of the will. Perhaps someone should have explained that better to the ladies. 😉 Let me know what fascinating info you find. Enjoy! As soon as I receive the “book” I will get a copy made for you and we will make some kind of arrangement to get it to you, if you are interested. That would be amazing!!! I have been subscribed to this article for YEARS hoping to get a glimpse of the inside, or any more info!!! Kaitlin…. Please share when Stuart gets the book to you!!! I made another trip to Bennington today. Here is my story. For those of you that know me, I am slightly obsessed with the Walloomsac Inn in Bennington Vt. This past Spring Jo and I went over to Bennington and took some more pictures of the Inn and while we were there we noticed that the church across the street was open. We went in and talked with the people there and they showed us a book that had been put together about the Inn. We had arrainged to get me a copy but that never happened. Today we went back. The lady let me take the book, (I had to leave Joanne at the church as collateral) I took it to Staples and copied the damn thing myself! There is a wealth of info in it. Time lines Guests, menues, pictures of the inside. I am totally stoked!. We went to an antique shop up the street for a while and on the way back we had to drive by the Inn again. The owner was outside watering her flowers! A couple of slightly illegal U-turns later I pulled up in frount of her house and got out of the van. I told her how much I loved her house and tried to carry on a conversation with her. She was extremely quiet and would only speak if I asked her a question or made a direct comment. A lady of Very few words! But Hey, you gotta start somewhere. Yup! Today was a pretty damn good day! Awesome sleuthing! Can you email Kaitlin some pics of the inside for her to upload for us all to see? Any other info would be great! I love the Inn as well!!! Hi Donna! I am going to try to get this all scanned into my computer. If all goes well, There will be pictures to share. Check out my FB page for more. I don’t do facebook. Can I still view the pics? Don’t worry. I will find a way to get them to you. I am sure that once Kaitlin has them, she has the way to get them posted. Yes, whenever I get new photos, I’ll post them. I don’t have any others to post now, however! Does anyone know if it’s brick underneath? I heard that it’s not going to fall down even if the clapboard falls off. No, it is not structurally brick. The frame is wood: a post and beam frame in the front and balloon framing in the late Victorian sections. There is probably brick nogging used as insulation within the wood frame – a common practice found in many early local buildings, but the brick is soft and would collapse if the Inn burned. PS: a structural brick wall is 3 bricks thick – minimum. One brick thick would fall down. Good Evening Laurie. I would be Very interested in joining that Facebook group if I could find it. If you could help connect me I would really appreciate it. There’s actually 2 facebook groups. One more active than the other but both have information about and pictures of the inn. The more active one is Bennington Vermont – Past and Present. The other one is Things I remember about Bennington Vermont. If you click on the photos tab you can go through all of them and find the ones of the inn and the comments that people have posted. But there is a lot of information about the history of Bennington itself that is quite interesting. Enjoy! Laurie, Thank You. I will give them a try. Send me a FR and you will be able to see my pics as well. Argh! I don’t do facebook! Is there any way for me to see the pictures? I am so sorry for the trouble! I have been following this blog for years hoping for a glimpse of the inside. Good Morning Donna. We have talked before. It looks like I will have to buy a new scanner as mine is still giving me fits. I will find a way to let you see the pics when I can get them into the computer. Maybe I should talk you into joining FB just so you can see more. Oh gosh… Don’t do that! I am sorry to keep pestering you!!! I’ll figure it out! No problem Donna! You are not pestering me. Just wanted to let you know I haven’t forgotten you. Thank you Stuart!!! You are so kind! If I can help in some way, let me know. I’m glad people can make connections through PiP! Thank You Kaitlin! I really appreciate it. I thought I took a reasonable sized mouthful but I think that was still more than I am able to handle. I will probably be buying a new scanner this weekend. I was wondering if you had a chance to do anything with the pictures that I emailed you. Did they come through OK? While I thought they were rare pictures, I have since found out there were other copies floating around. It is amazing how much info is really out there. Hi Stuart, yes, I got them – writing back to you right now! My wife and I were married in Knoxville, TN, in August, 1968. We headed to New England on our honeymoon with no particular itinerary. We had no reservations but just looked for anything that might be a different or unusual place to sleep. When dusk came on the third or fourth night out we were in Bennington and I noticed a little sign along the road that said something about an Inn. We took the bait and registered at the Walloomsac for the night. We had no clue about the history of the old place but thought it would be an adventure to remember. Sadly we took no pictures but we remember up a beautiful staircase up to a large room with many windows and a balcony outside. We slept a very squeaky high backed bed and used an antique claw-foot tub for baths. I am pretty sure that we signed the guest book in the morning and somewhere inside or out, read a sign that this was the oldest continually operating Inn in Vermont. I think the sign gave the age as 207 years. Being on our honeymoon we went on our way to other ‘adventures’ not giving the old building much thought. I guess we auusmed this type of thing was probably not all that unusual in that part of the country. Three summers ago we were heading to the lakes in Maine with our daughter and on our return trip back to her home in Virginia we saw an interstate exit sign to Bennington. My daughter in her car called me on her cell phone and asked if we wanted to detour and see if the Inn was still standing. I guess at some point we had mentioned the place and our curiosity about its fate. She didn’t have to ask twice. When we finally found the Inn, my wife at first claimed that she had never seen, let alone slept in that place. We walked around, took pictures and convinced ourselves that this was indeed the place we had slept just as had Jefferson and Washington.I think it was the ‘falling down’ balcony along the side street that was the final proof. Both our marriage and the building were (and are) still standing! I would love know were we might see information and or pictures, especially inside pictures. What would be the icing on the cake would be to know if there still exists a guest register from 1968. Phil, what a wonderful story. Thank you for sharing. Unfortunately, I do not know of any available interior photos. I would also love to see it. But, follow the comments in this post as readers will often offer info and the latest news. Congratulations to you and your wife on a long successful marriage. I hope you are having many adventures! I do have some “inside” pictures that were part of my book. I am still arguing with my scanner. As soon as I can I will get them to you. Trust me Kaitlin, This whole ordeal has been a pain. I guess this is what happens when you get obsessed with something. This also looks like a candidate for engagement with the owners followed by publicity and creative thinking in terms of helping them figure out how to do maintenance for little or no cost — like having Boy Scouts come paint (or was it whitewashed?) to earn a badge, or if there’s a local tech college having students there come do supervised carpentry or masonry repairs. SWAT team. I LOVE IT! I think some of us flamingos have similar dreams. I really wish that educational institutions with HP degrees would do more in the community, hands-on work. It’s few and far between. I thought the same thing while getting my degree. Buildings and groups with no funds in need of expertise and students with expertise looking for class projects — [potential] match made in heaven! I kept saying it and it seemed to make no difference, so I decided to try and make the difference. I called some local nonprofits and sites to ask for a wishlist and then created a PROJECTS notebook that I put in the HP office. My thought was that students could go look for ideas/connections when they needed a topic/project idea for a class, and that the office (or a student appointee) could be a community contact and keep the notebook updated after I was gone. I suspect that instead the notebook is gone. It’s why I have the “bulletin board” on my site — so I can try and play matchmaker that way. Nice work here on the Walloomsac. My mother stayed there back in the early ’70s when it was still open. Very eerie tale involving condemned sections, strange noises, no sleep, etc. A real hair raiser. She and her sister shared a room at the end of a hallway where it met a separate section of the Inn. This section was closed and so the wall in their room was shared by another room that could not be rented. They spent the whole night listening to crashing and banging coming from the room adjacent. She described these noises as furniture being slid across the floor. Really loud. My aunt has confirmed all this. They cowered all night and asked the proprietor about it that morning. The individual mentioned that there was no possible way that anyone had been in the room adjacent or that anyone had been moving furniture at any time during the night. They promptly left. And so I’ve lived with this tale for some years now but have yet to actually visit the building. I searched around a few years ago and found some photos. But thanks for the update. And yes, what a gem. It’s a shame that something this old, with so much history is fading fast from deterioration and neglect. Right there in front of everyone. Anywho, I really enjoy your site. And thanks again for all your help at last year’s SIA Fall Tour. Thanks for visiting PiP! And especially for sharing your family stories of the Walloomsac Inn. At the very least, hopefully this post will help to gather or to inspire collections of stories about the building. Hope all is well with you! Holy Cow, sounds like it needs a paranormal investigation. I can’t volunteer because my team broke up. This Inn looks very much like the O’Hara house in Lexington NY. The O’Hara house however, is in worse shape. My friend and I went up on the porch and it was shifting under our feet. I told her to get off right away. The roofline is now sagging horribly and any day now I expect it to begin falling down. I’m sure there have been paranormal investigations – at least around the house! It must have been really cool. wow, what a place! It’s not, Arlene said. Sharron and Laura (Arlene’s twin identical nieces) seconded that. However, Arlene remarked that the twins’ mother, Kathleen Kaiser (Arlene’s sister), used to hold fake séances as a child in the inn. While she was just a kid, fooling around, it was enough to scare people staying at the Walloomsac. Walter Jr. finally made her stop when “she used to scare the dickens out of the guests,” Arlene said. Perhaps she does not want the attention a haunted in would generate? Who knows. Does your mother have any pictures of the inside? Donna, thanks for mentioning the Bennington Banner article and for this tidbit here. Fascinating! I would love to see photos of the interior, too, if anyone has them. I am so glad I found your site. I LOVE IT!!!! Great work!!! PLEASE PLEASE put up any pics of the inside if you get any!!! thank you, Donna! I’m so glad that you enjoy Preservation in Pink. I’ll be sure to follow up on the Walloomsac if I find any other information. The people that own the Inn don’t want any help with rebuilding the structure or fixing it up. Believe me…I think everyone in town would love to see this place refurbished and brought back to its original glory. Nothing can be done until the family changes their mind. It’s not the ideal situation, but please don’t think the town doesn’t want to help or assist in some way. I’m a historic preservationist in Windham County and I just came across your great website. I too miss having people to talk to about historic preservation. The Walloomsac has been breaking my heart since I was a child. I just drove by it last weekend, sigh…. I had to laugh at the pink flamingo thing. There are 2 of them in my backyard. We share a property with my landlord, whose girlfriend decided that after the backyard was destroyed by Irene’s wrath that she wanted to cheer things up. There are also some other local friends who move around a pink flamingo from yard to yard as a joke. Looking forward to reading more of the website! I know your name well! So glad you came across the blog. 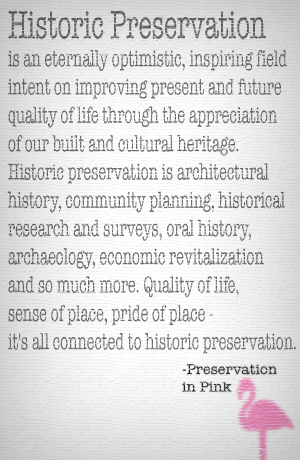 Stop by anytime for preservation chatter. And I’m glad to hear there are flamingos everywhere serving such good purposes as cheering up the flooded landscape. 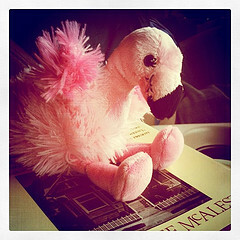 I even have a pair of Christmas flamingos – it never stops! please contact me if any oics are taken in the inside..so I can viewthanks!!! I live in Bennington–born and raised. Actually, I live just down the hill from the Walloomsac Inn. It’s sad, really, that they would let their own feelings get in the way of restoring this building, but instead it’s just going to rot because they don’t see that it’s not about them. Sad, indeed. Thanks for the update and clarification. I too love this place. Take pics everytime I am in Bennington. Have some of the barns, a couple of the inside when it was still an Inn, and an advertisement book I acquired off Ebay a few years back. I do so wish I had lived back then to see the grandeur of the place. The Berry’s so need so swollow their pride and let the Historical Society help before it is too late … if it isnt already! If I can get access to a scanner will scan my pics & post them. I am so excited to hopefully inside pictures!! Please, please find a scanner!! Thanks!!! I grew up in Bennington. I briefly knew one of the daughters, the art student. She was really nice. I remember her telling me that everybody asks about the restoration, but a person in the family felt strongly that everything on the building was the “original” and did not want to change or remove the “original” pieces. And the not taking charity comment sounds right too, they are a very humble and sweet family. I was there August 13, 2012 (4 days ago from today) and was shocked and in awe of the building. We had lunch down the road and the lady there said the reason the owner did not fix up the building was because she would not be able to afford the increase in property tax and would lose the building. I can’t believe that could be true! Government regulations are often a hurdle in trying to restore but in this case I would think there would be something to help them. It is a beautiful place and I’m so glad I was able to see it. I would have paid just to set foot inside. I was told there was a ballroom on the second floor. I stayed for one night in the inn in 1985 driving from NY to Burlington. It was a definite throwback to the late 19th century but in remarkably decent condition on the inside. It was like stepping into a time capsule–nothing faux or cutesy for sure. It was all real. I believe there were other guests but I don’t recall actually seeing them. They didn’t serve food but I arrived late enough that it didn’t matter. I still remember it as a neat experience. Hopefully the building will be there when preservationists finally get access. 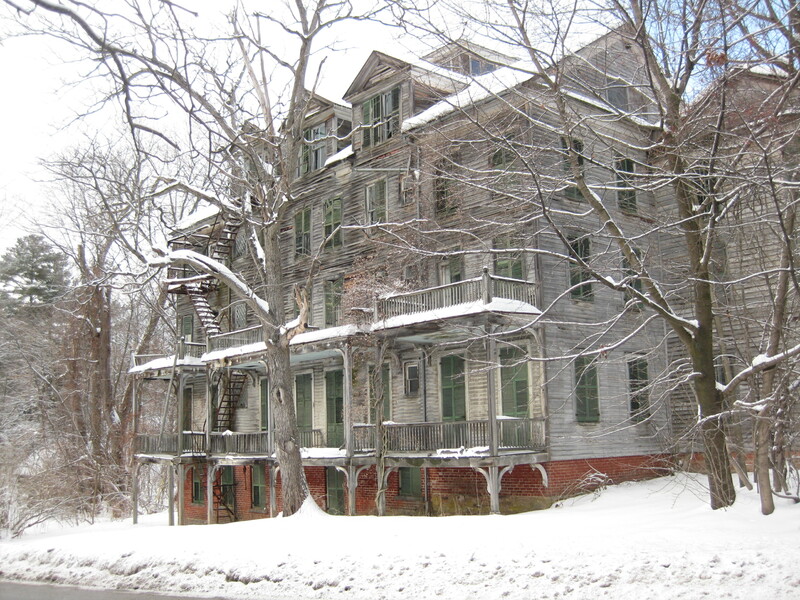 the walloomsac inn was the subject of my utter fascination when i was growing up; as i knew it, it was a bonafide haunted house. according to the lore, my parents had stayed there one night on a lark in the 70’s. my mom, who felt a strange vibe from the inn and was compelled to keep the light on when she went to sleep, woke up in the middle of the night to see a man dressed in green and wearing a green hat pointing at the light. she was dumbfounded but got the impression that he wanted her to turn it off. so she did and the little man was then gone. she woke my dad up immediately of course. she described the man to him and he, being a history buff, said that it sounded like someone from the green mountain boys (militia men from vermont who fought in revolutionary war times, and actually began in 1770 in bennington!) well my mom is greek, and had no idea about the existence of those guys! the next morning after they left and went to have breakfast at a local cafe, the cafe owner said she was impressed that they made it through the night, and that she had heard it was haunted and she wouldn’t have ever stayed there herself. i will never forget the first time i saw it, when i was 18. an incredible building and presence. 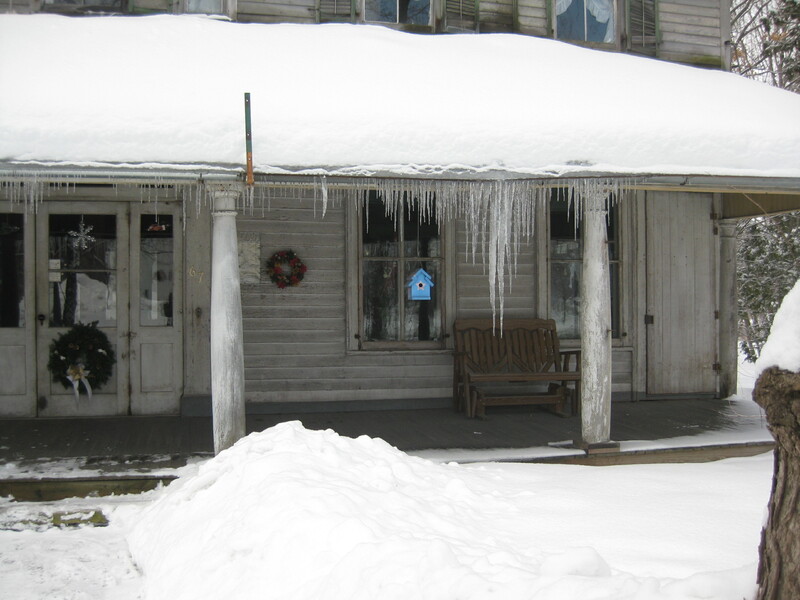 there is definitely something special about the walloomsac inn! What a magnificent wooden building. It is a great pity that it is now in so bad condition! Oh I know, so sad. It’s a big topic in the community, as you can see from the comments. I really hope the owners have a change of heart about accepting help to get it restored… They knew it was a historic place when they bought it… it’s pretty selfish to NOT try & restore it. Most places around here have that in the buying contract that you HAVE to do your best to restore it, or it gets taken over by the state & you lose. Just so you know, the building under those clapboards is made of brick. Most of the deterioration is in the facade of wood. I agree with you Paul, that is what makes it so spooky and special. Paint it up and it’s just another historic building. I travel through New England three to four times a year to visit family and go right by the Inn. Every time I hope to see some improvement or restoration. I don’t want it changed, just kept so it does not fall down. I understand that the ladies that live there are quite old and want to hold on to their family request, but it seems that something could be done to help them. I suppose though if that were true it would be happening. I just hope that on one of my trips I don’t find it fallen in, that would be such a shame! It is beautiful.! Yikes! Quite old? Hardly. They are merely middle-aged. Unfortunately, it’s a misconception that the government can save any buildings. Funds for rehabilitation, for example, are only available to non-profit groups or municipalities. The money awarded to such properties comes with strings too (aka the Secretary of the Interior’s Standards). On the other hand, private owners are free to do what they want with their own properties. Imagine what would happen if the government could just give money to any property. The Walloomsac Inn is a historic property (listed in the National Register of Historic Places) but that doesn’t put restrictions on it from its owners. It doesn’t come with regulations. What the National Register does is protect historic properties from government projects (like roadway projects that would demolish historic buildings, for example). Still, it’s a shame to lose this building! Fingers crossed for a preservation miracle. Kaitlin, great explanation of what it means, and what it does not mean, to be on the Register. It would be incredible if the current owners would allow tours. There is potential to restore the structure by donations. One solution, a not entirely satisfying one, would be to “shrink” the Inn back to a more manageable building, back into a historic core. Like they did with the Wentworth by the Sea Hotel on Portsmouth ( NH ) Harbor. It was in worse shape than the Walloomsac when I visited years ago before the restoration, with snow in the mansard roof attic and wind blowing through.. Two thirds of the Wentworth, the newer sections, were demolished but the oldest section is now a lively and popular hotel. Drastic? Yes. But the Wentworth points one possible way. My wife and I went on a road trip yesterday and stopped to take pictures of this beautiful landmark. I try to respect peoples privacy so all my photography was done from across the street. Every time we travel that way, I bring the camera and I have shots from all seasons. We were standing in the common area across the street from the house and we saw someone sitting just inside one of the 2nd story windows. I gave her a smile and a big thumbs up to show her that I appreciated her house. A short while later, as we were leaving, I waved good-bye and much to my amazement, I received the shock of my life. She actually gave me the Finger! My wife and I laughed about this all the way home. Just because someone such as myself has an appreciation for history and fine construction, doesn’t make them threatening. I was not trespassing or making myself obnoxious. I just have this love for this old house. I now can understand why this person is alone in this big old house that is meant to hear the laughter and footsteps of many people. I will continue to stop and take pictures whenever I am going by. If I was sitting here in my bedroom, looked out the window, and saw some guy snapping pics of my house with a telescopic lens, and the only thing he did was show me a “big thumbs up”, I would have flipped him off, too. LOL. I’m not saying what you did was the wrong thing, but I am saying it probably did feel quite obnoxious to the other person. Just to set the record straight, I was not using a telephoto lens and I was not trying for any “inside” shots. If you have ever been there during different times of the day, the changing light changes the view of the house. I have several shots of the house taken from the same location during different times of day and different time of year. They all bring out different details. As far as the thumbs up, what would you recommend? Should I have blown her a kiss? Could i get in trouble if its abandone and live in one of the houses if no one lives there? Yes, because the property is still owned by someone. I feel like the people who live there are ghosts, hiding something… so many people would love to see the inside and it’s impossible… what an awesomely frustrating phenomenon! I’m a Dewey and interested in more information and my possible family connection. I was browsing places to stay in 1969 with my wife and 3 friends. I came across the Waloomsac for 6.00/night. I said “how bad can it be” and booked it. Wow it doesn’t look much different now than it did in 1969. Anyway the receptionist said her husband bought the Inn in 1891!!! Large dining area was all set up but had not served food since the 20’s. Shades were shredded and the bath water was cold and rusty, but totally complete with period victorian furniture. Local townsfolk were amazed when we asked for directions because we had rooms there for the night. No other visitors that night and possibly anytime thereafter. I understand the present owner is under obligation never to paint, restore, or even fix anything, save probably plumbing or electricity. A unique and fun memory to say the least. Did I read this correctly? Her husband bought the Inn in 1891? Was she a ghost? That would have sent most people running for the door. Not me, I am a paranormal investigator ( retired), but I thought I read the date wrong. Her husband was either very old or passed, right? You did, but I think the other poster referred to a time in the 1960s. Less creepy than that if it was 2018! You bet. I tried to do some math. Assume the buyer was 20 in 1891 I guess he would have been 78 at the time. You are right, now it doesn’t sound so awful. I am 72 and still doing everything I want. If it were 2018, it would be a totally different experience. Just stumbled here after doing some research on Bennington. I’ve driven by many times and love to see some info. This whole place and situation seem like a true mystery novel waiting to be written. Thank you for writing this blog!